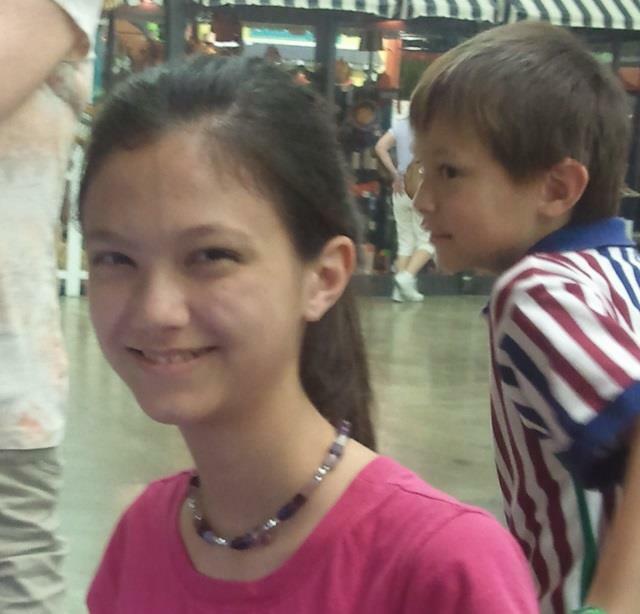 On Friday, September 26th, 2014, Tim, Jeri, Jeffrey, Lizzie, and Josiah spent the day at the L.A. Country Fair. Although this month has seen a lot of unseasonably HOT for Southern California, we were able to get nearly ideal weather. 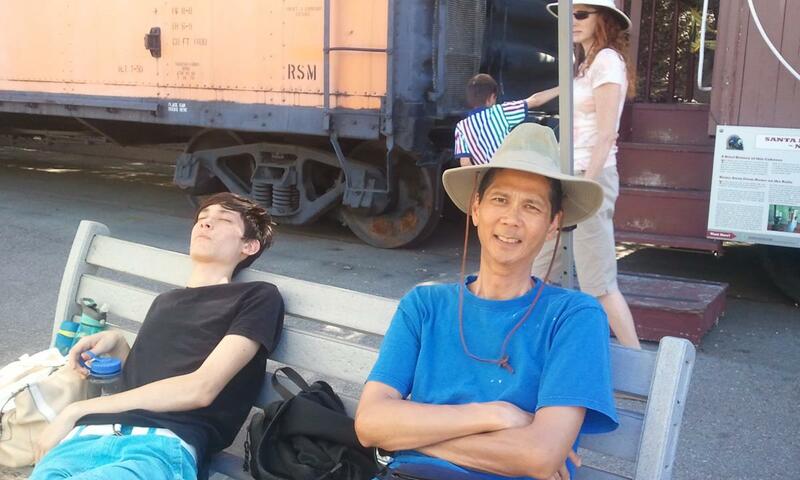 Tim took the day off from work. By registering in advance, school groups (including home schoolers) can attend the LA County Fair for free. We had to register and select a weekday a few months back. 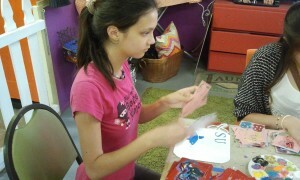 Our first stop (after dropping off our lunch at the lunch storage area) was to the DIY Design Studio. 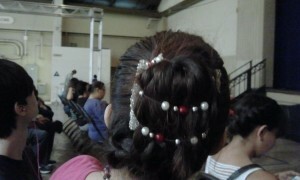 A lot of very nice crafts were displayed. We saw some nice crocheted works, photography, baked goods, etc. Lizzie was able to make herself a necklace. 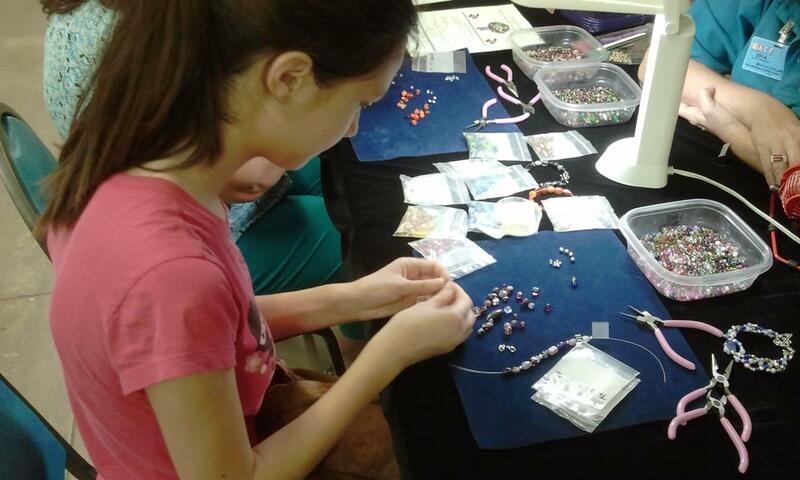 Lizzie Making Her Own Necklace. Click photo for full size. Lizzie’s New Necklace. Click photo for full size. 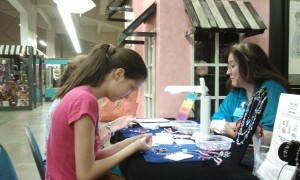 Lizzie Adding Pieces to Her Necklace. Click photo for full size. Then we headed back to the picnic area and ate the lunch that we brought from home. 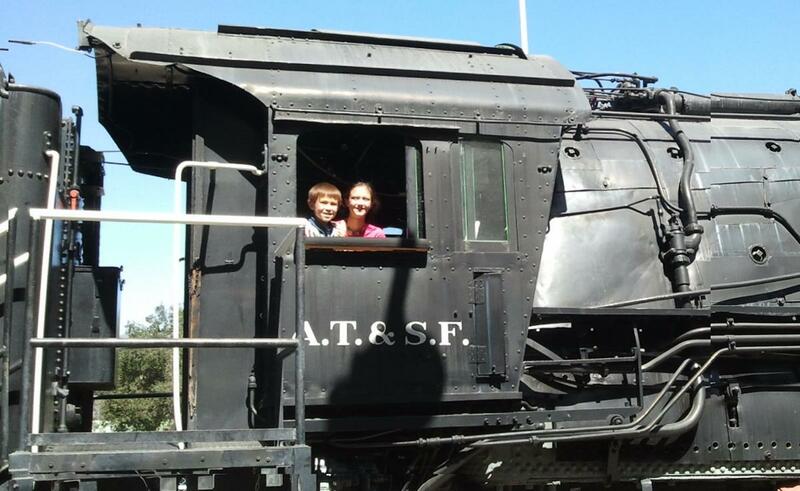 Because Josiah really wanted to see the trains, we headed there next. 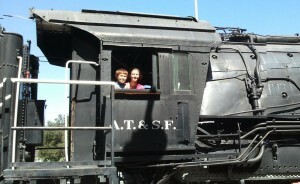 Josiah and Lizzie as Train Engineers. Click photo for full size. Josiah and Lizzie Next to a Huge Union Pacific Engine. Click photo for full size. Jeffrey and Tim Resting in the Railroad Area. Click photo for full size. Next we headed to the 2:00 PM showing of the Sinbad High Dive Show. The divers were very talented and entertaining. They concluded with a diver jumping from the highest platform. 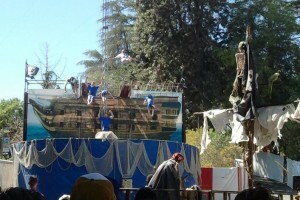 The Sinbad High Dive Show. Click photo for full size. 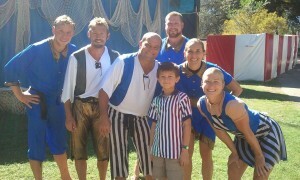 Josiah with the High Dive Cast. Click photo for full size. 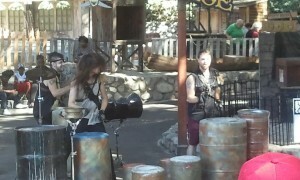 Next up in the Pirates Adventure area was a group called Street Drum Corps. 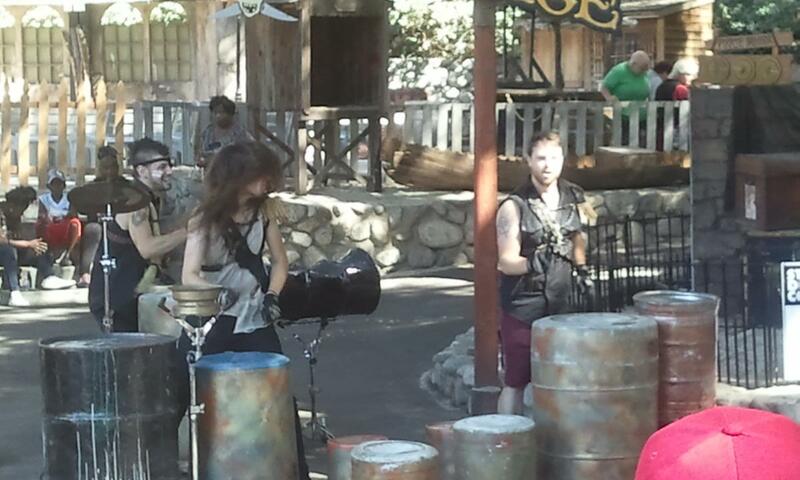 They had some non-typical drums and played very well together. It was fun to watch and listen to them. Street Drum Corps. Click photo for full size. While Tim, Jeffrey, and Josiah decided to stay for the Pirates of the Sky show, Lizzie wanted to go back to the DIY Design Studio. So Jeri headed out with her. They stopped at a Chinese display. 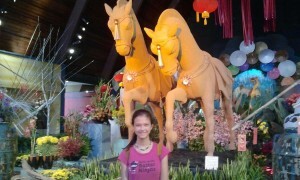 Lizzie in the Chinese Display. Click photo for full size. 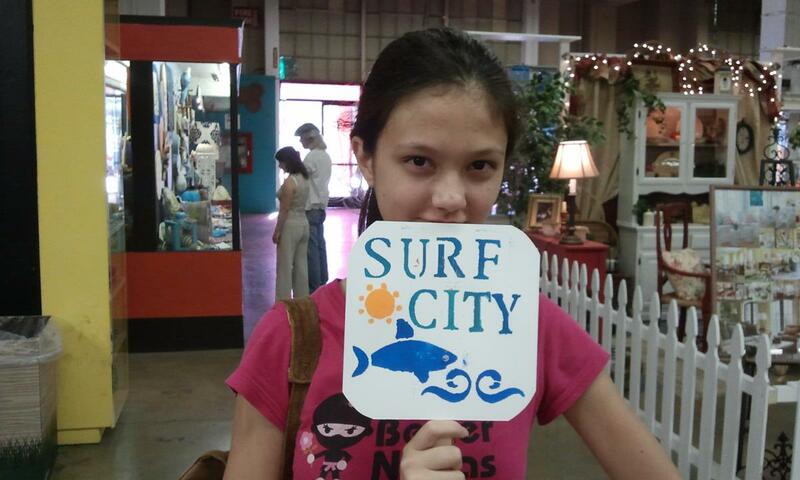 Using stencils, Lizzie made a cute fan. Lizzie Making a Fan. Click photo for full size. 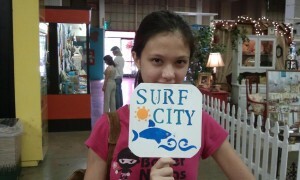 Lizzie’s Surf City Fan. Click photo for full size. The Pirates of the Sky had some nice acts. 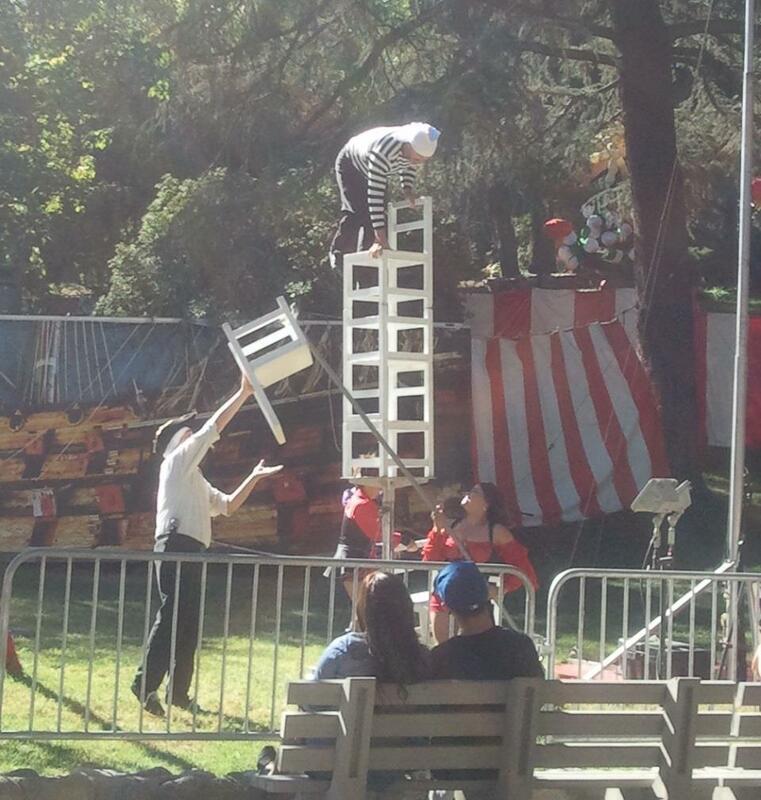 Here’s a picture as the leader stacked six chairs and stood on top. 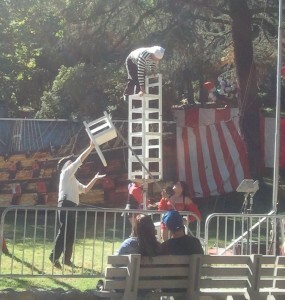 The Fearless Nocks Stacking Chairs. Click photo for full size. 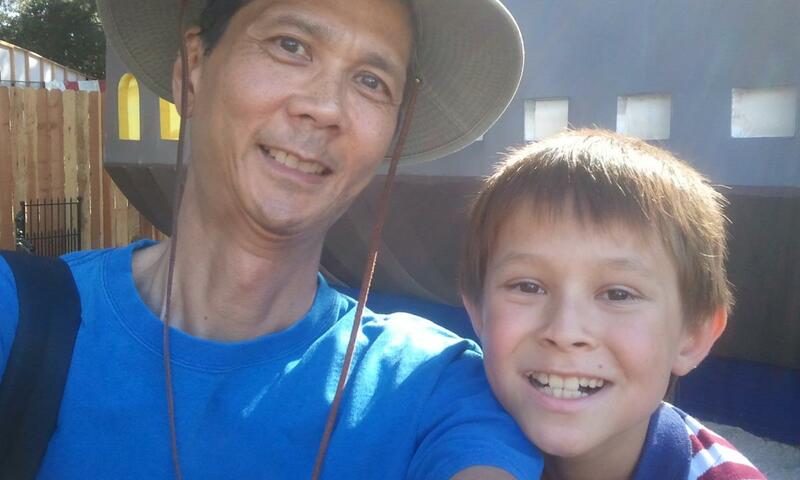 I took a selfie with Josiah. Selfie of Tim and Josiah in Front of a Chinese Luminasia Ship. Click photo for full size. 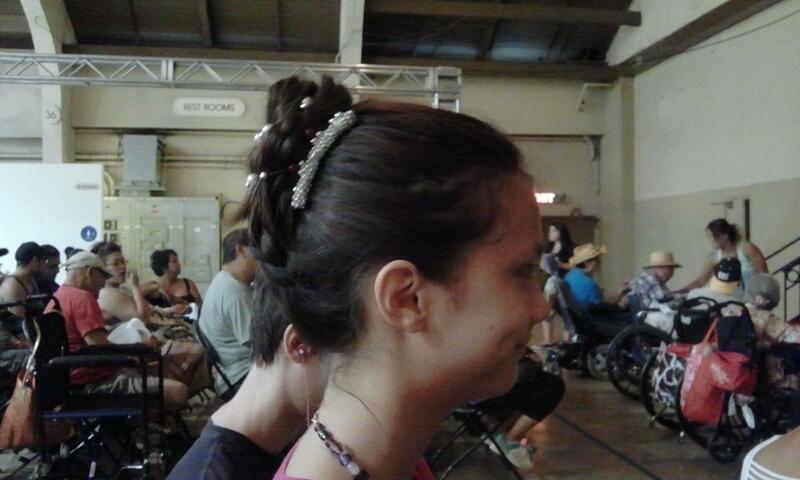 Jeri and Lizzie found a cool hair piece. So they bought it as an Christmas gift. It comes with one-year warranty. 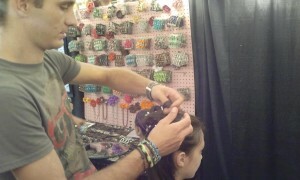 Here’s the sales guy doing Lizzie’s hair. Lizzie Getting Her Hair Done with a New Hair Piece. Click photo for full size. Lizzie’s New Hair Piece. Click photo for full size. Modeling Her Hair Piece. Click photo for full size. 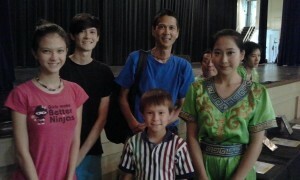 We all headed to the Big Top Theatre for the Chinese Circus of Beijing. We thought the show was at 4:00 PM. So we got there half an hour early and got seats in the second row of the center section. The show, like every year, was amazing. We bought their DVD so we could show the rest of the family. 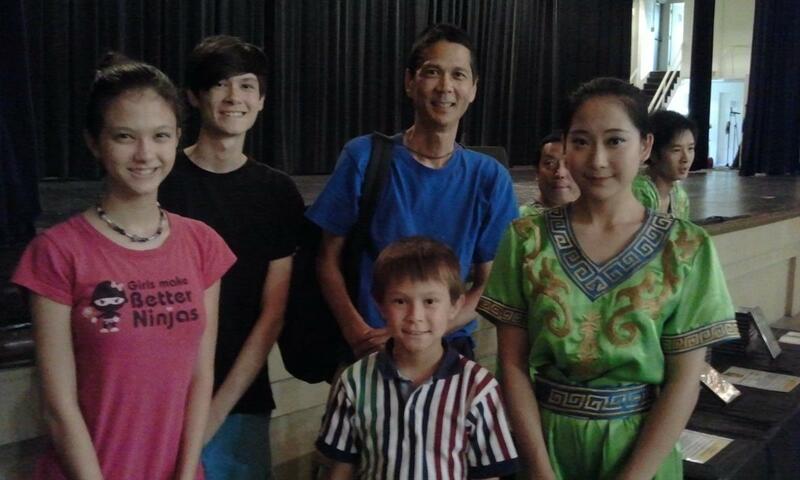 After the Chinese Acrobat Show. Click photo for full size. Afterwards we headed to the Hall of Heroes display. Here they had exhibits both of real-life heros as well as superheros. 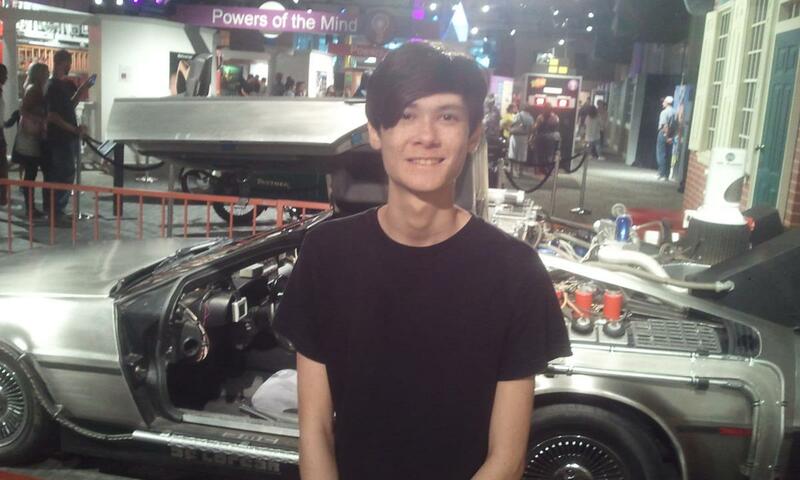 Here’s Jeffrey standing in front of the car used in the movie Back to the Future. Jeffrey Next to the Back to the Future Car. Click photo for full size. At 6:00 PM, we headed to Knight School. Josiah has always enjoyed sword fighting at home…he sometimes has a hard time finding willing partners. At this school, he learned the On Guard stance, how to advance and retreat, how to duck and jump, and how to block. They ended with all of the students being knighted. 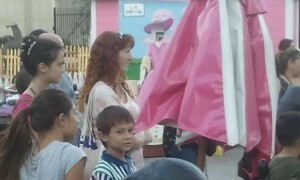 Lizzie, Jeri, and Josiah Waiting Outside of the Knight School. Click photo for full size. 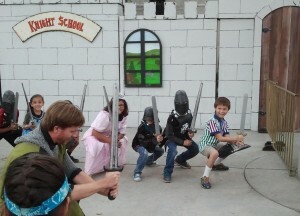 Josiah in Knight School. Click photo for full size. Next up was the Archery School right next door. 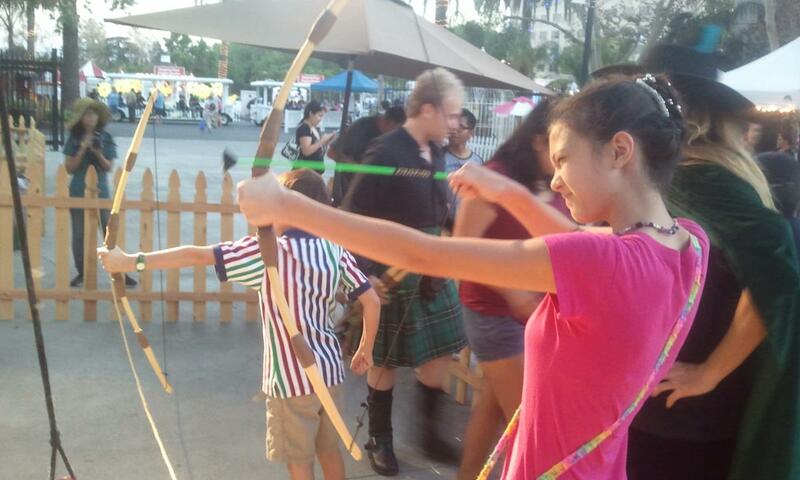 The students got to shoot arrows with rubber suction cups. The instructor would occasionally shoot a real arrow. Josiah and Lizzie in Archery School. Click photo for full size. Next we headed back to the Pirates Adventure area for the 7:00 PM show called the Shipwreck Pirates Show. We figured that it was some type of pirate show. 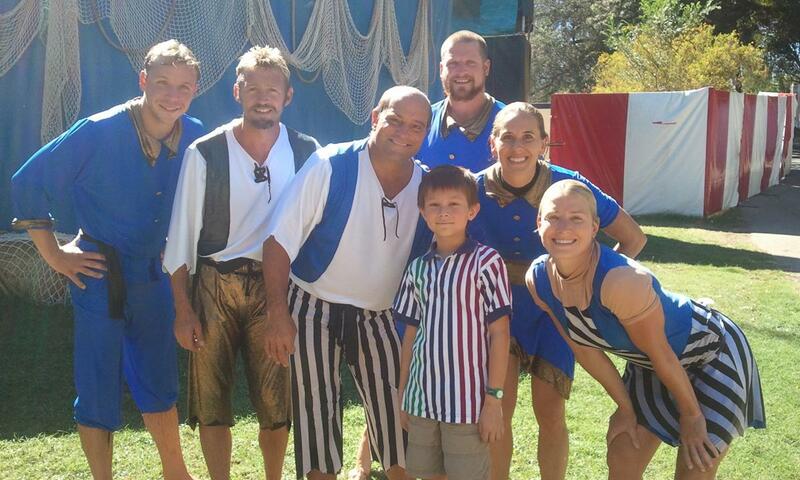 It turned out to be a “magic” pirates show. And a good one indeed. They did a number of acts where they “cut” through fingers and arms. 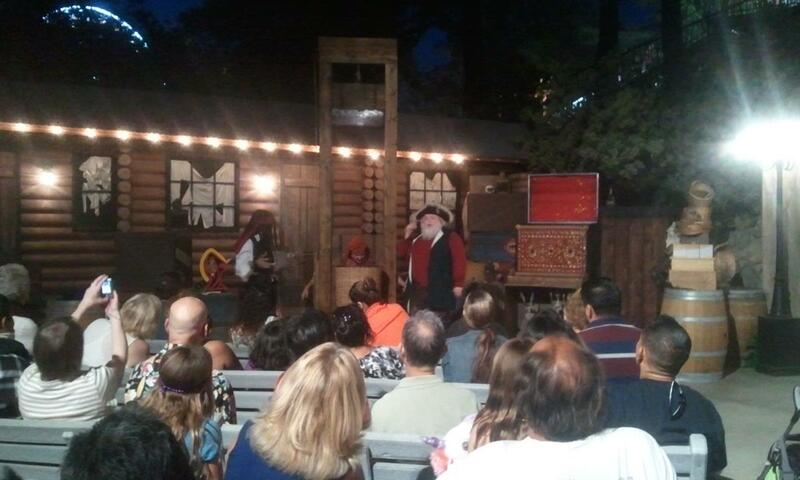 The final act used a guillotine to cut off someone’s head. We saw them stick his head into the guillotine, secure it, drop the blade, and then we saw his head fall off. Not sure how they did that one. After the show, we got a picture with Captain Jack Sparrow. 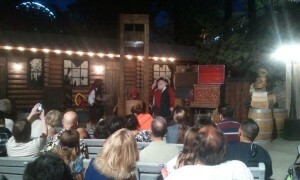 Guy in the Guillotine at the Shipwreck Pirates Show. Click photo for full size. 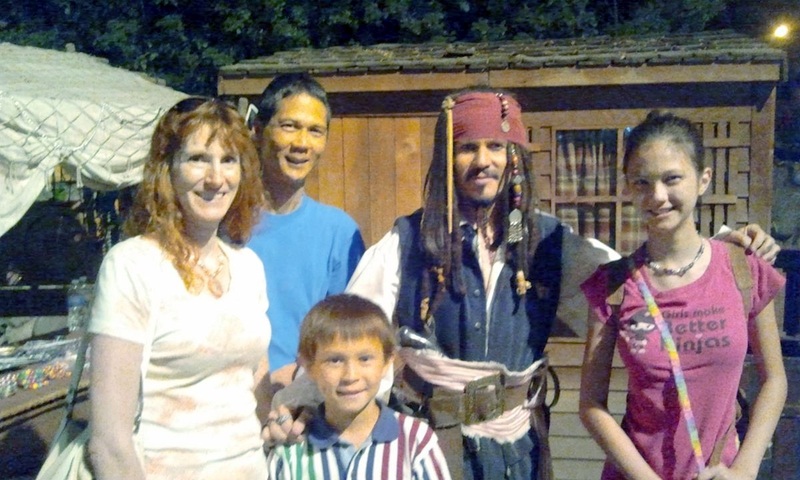 Jeri, Tim, Josiah, and Lizzie with Captain Jack. Click photo for full size. Although we didn’t want to pay extra to walk through the Luminasia area, we could view part of it from outside. 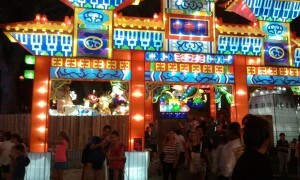 Luminasia. Click photo for full size. 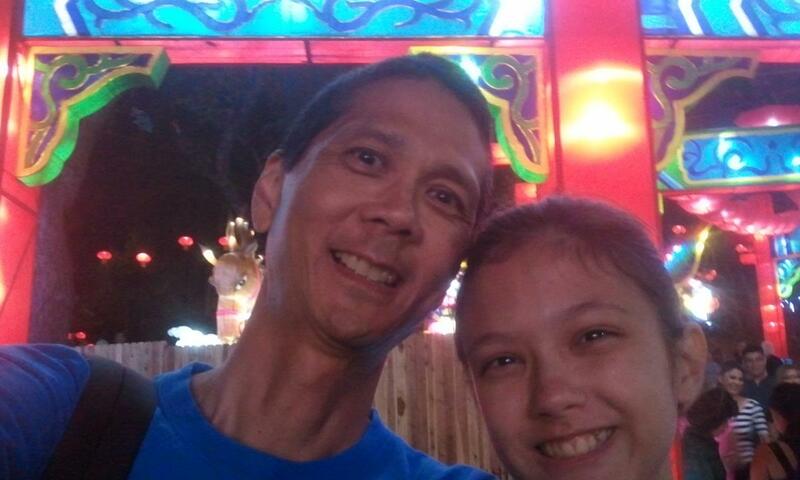 Selfie Tim and Lizzie Outside of Luminasia. Click photo for full size. 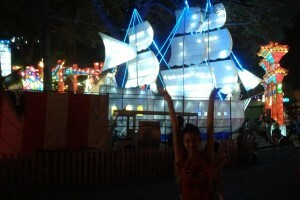 Lizzie Standing in Front of Luminasia Ship. Click photo for full size. They also had a nice animal exhibit with a wide variety of animals: zebras, frogs, alligators, porcupines, snakes, cockroaches, monkeys, and more. 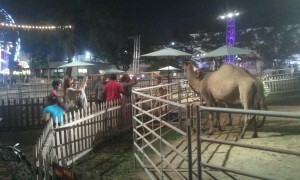 Josiah got to feed a camel (for a dollar). Lizzie and Jeri Watching Them Feed the Camels. 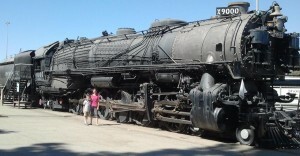 Click photo for full size. On our way out of the fairgrounds, we stopped to see an exhibit highlighting changes following World War II. Then we got an order of fries (for about $5) and sat down and enjoyed them. Plus we had enjoyed snacks that we had brought along with us. We drove back to Fountain Valley and stopped at Del Taco to pickup some food. We made it home around 10:00 PM…not quite 12 hours since we had left.